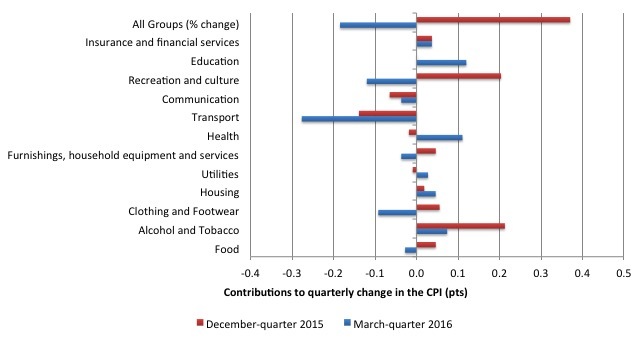 The All Groups CPI fell by 0.2 per cent compared with a rise of 0.4 per cent in the December-quarter 2015. The All Groups CPI rose by 1.3 per cent over the 12 months to the March-quarter 2016, compared to the annualised rise of 1.5 per cent over the 12 months to December-quarter 2015. The Trimmed mean series rose by 0.2 per cent in the March-quarter 2016 (down from 0.6 per cent in the December-quarter 2015) and by 1.7 per cent over the previous year (down from 2.1 per cent for the 12 months to December-quarter 2015). The Weighted median series rose by 0.1 per cent in the March-quarter 2016 (down from 0.4 per cent in the December-quarter 2015) and by 1.4 per cent over the previous year (down from 1.9 per cent for the 12 months to the December-quarter 2015). The significant price rises this quarter were for secondary education (+4.6 per cent), medical and hospital services (+1.6 per cent) and pharmaceutical products (+4.8 per cent). The most significant offsetting price falls this quarter were for automotive fuel (-10.0 per cent), fruit (-11.1 per cent) and international holiday travel and accommodation (-2.0 per cent). The pressure is now on the RBA to reduce interest rates given that their preferred measures (see below) are now well below their targetting range (2 to 3 per cent). The RBA might drop rates though if interprets yesterday’s inflation data to be a further sign that the economy is in trouble. But then the RBA has little scope to influence total spending anyway. I dealt with that issue in this blog – Monetary policy is largely ineffective – which detailed why fiscal policy is a superior set of spending and taxation tools through which a national government can influence variations in activity in the real economy. 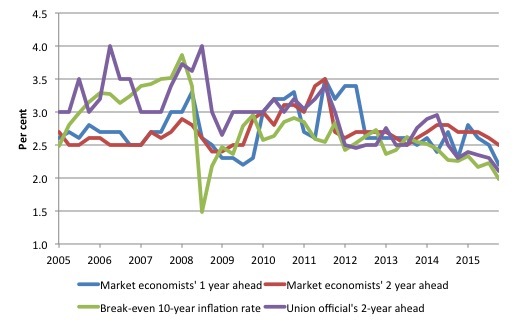 What is apparent from yesterday’s inflation figures and the most recent labour market data (see blog – Australian labour market – still weak with a moderate upturn – is that there is plenty of room for further fiscal stimulus. How to align that reality with the political narratives from both sides of politics which is running the exact opposite line. Next week (Tuesday, the Federal government will bring down the fiscal statement (aka ‘The Budget’) for 2016-17 and the public discussion leading up to that event has been asinine to a degree that is almost unimaginable. It gets worse every year. And then the journalist proceeded to act as the media spokesperson for the company who makes profits out of their regular warnings of doom (Access Economics). First, the role of the media (particularly analytical pieces) is not to just rehearse the statements of a known neo-liberal organisation that has an appalling record in its fiscal predictions. Please read my blog – A Budget that reduces growth and increases joblessness – for no sound reason – for more discussion on this point. Second, the journalist did not seek alternative opinion, which is a damning statement of the biased reported. Third, the only alternative voice presented was the Opposition Labor Treasury spokesperson, who embarassed himself, once again, by attacking the Government for not having “a better result than this” – meaning they should have been running a smaller fiscal deficit – just like the fatuous Labor Party aspires to. And this is one of the more reasonable articles – if you can believe that. Why is a rising fiscal deficit a “deterioration”? Why isn’t the deterioration expressed in terms of a significantly declining real GDP growth rate, the persistently elevated levels of labour underutilisation, the rising income inequality and poverty rates, and now the beginnings of a deflationary spiral? The fiscal balance is just a reflection of the state of the real economy and the fact that it is higher than expected just reflects the damage that the restrictive fiscal policy (the pursuit of surplus) is doing. The ‘unexpected’ rise in the likely fiscal deficit over the next two years is a statement in itself. In my forecasts as part of this year’s Fairfax Annual Economic Survey panel, I forecast the fiscal deficit to rise this year (2015-16) to $A45 billion (after the government had forecast it to come in at $A37.4 billion. I also forecast a rise to $A50 billion next fiscal year (2016-17), while the government forecast was $A33.7 billion. Those forecasts are certainly in the right direction and reflect my assessment of how poorly the economy is performing. The rising deficits are ‘good’ in the sense they are helping to support aggregate spending in an economy where private investment expenditure is declining rapidly and households are becoming (understandably) more cautious. What a reasonable commentary would have said is that there is no such thing as a ‘deteriorating’ fiscal balance. It is what it is. The question is why it is changing and what we assess to be the quality of those factors that are driving these changes. The media is resolutely silent on those sorts of understandings. Anyway, the newly recorded deflation for the March-quarter 2016 is one part of the sorry story that political incompetence is generating in this nation. Far from being a nation of free souls, we are, in reality, a collective of idiots – running headlong towards the cliff! The headline inflation rate decreased by 0.2 per cent in the March-quarter 2016 translating into an annualised increase of 1.3 per cent, down from 1.7 per cent in the December-quarter 2015. It is the first time that the inflation rate has been negative since the December-quarter 2008, when the GFC was threatening to engulf us and thanks to the significant fiscal stimulus did not. What does it mean for monetary policy? Is a headline rate of CPI at -0.2 per cent for the March-quarter 2016 significant for monetary policy decisions? To examine its lasting significance we have to dig deeper and sort out underlying structural inflation pressures and ephemeral price factors. 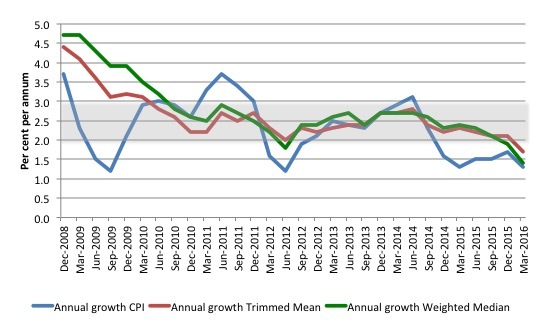 The following graph shows the three main inflation series published by the ABS since the December-quarter 2008 – the annual percentage change in the all items CPI (blue line); the annual changes in the weighted median (green line) and the trimmed mean (red line). The RBAs inflation targetting band is 2 to 3 per cent (shaded area). 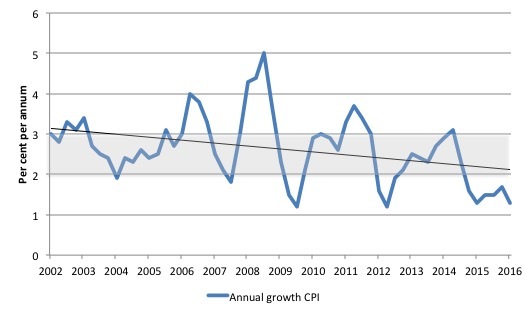 The CPI measure of inflation (falling to 1.3 per cent) is now well below the target band, while the RBAs preferred measures – the Trimmed Mean (1.7 per cent down from 2.1 per cent) and the Weighted Median (1.4 per cent down from 1.9 per cent) – are both also well below the lower bound of the RBAs targetting range of 2 to 3 per cent. First, there is clearly a downward trend in all of the measures. The “core” measures used by the RBA have been benign for many quarters even with a relatively large fiscal deficit and record low interest rates. They are now trending down sharply. Second, it is clear that the RBA-preferred measures are well below the lowest inflation-targeting band rate of 2 per cent. The RBA will also be mindful that real GDP growth is well below trend and faltering and the labour market is weak and getting weaker. In terms of their legislative obligations to maintain full employment and price stability, one would think the RBA would have to cut interest rates in the coming month given the failing economy and the benign inflation environment. The RBA has little excuse but to cut now that all three measures are below the targetting range and deflation has arrived. The following bar chart compares the contributions to the quarterly change in the CPI for the March-quarter 2016 (blue bars) compared to the December-quarter 2015 (red bars). The most significant price falls this quarter are automotive fuel (-10.0%), fruit (-11.1%) and international holiday travel and accommodation (-2.0%). The most significant offsetting price rises this quarter are secondary education (+4.6%), medical and hospital services (+1.6%) and pharmaceutical products (+4.8%). In the twelve months to March 2016, the major drivers of inflation were Health, Housing, and Alcohol and Tobacco Prices, and, to a lesser extent, Insurance and Financial Services and Education. The tobacco and health price rises largely reflect government policy changes. The fear of inflation, in part, drives the misplaced faith in monetary policy over fiscal policy. The fact is that there was no basis for those predictions in 2009 and seven years later inflation is turning into deflation despite the rising estimates of the fiscal deficit. The following graph shows four measures of expected inflation expectations produced by the RBA – Inflation Expectations – G3 – from the June-quarter 2005 to the March-quarter 2016. This is no surprise as the ‘market economists’ systematically get movements in the economy wrong and one wonders if their organisations actually bet money on their analysis! The most reliable measure – the Break-even 10-year inflation rate – is at the lower bound of the RBA targetting range. The expectations are still lagging behind the actual inflation rate, which means that forecasters progressively catch up to their previous forecast errors rather than instantaneously adjust, a further piece of evidence that refutes the mainstream economics hypothesis that we have ‘rational expectations’ (that is, on average get it right). It was nonsensical talk even then when growth was stronger and unemployment lower. Australia has now joined the deflationary brigade of sorry nations that have incompetent government dominated by neo-liberal Groupthink. Something has to give in the policy debate which remain dominated by a supposed urgent need to record fiscal surpluses. We should be thankful that the fiscal deficits are actually rising (through the automatic stabilisers). The real economy – where peoples’ lives depend – would be in worse shape than it currently is if the politicians actually succeeded in carrying out their desires to reduce the fiscal balance. 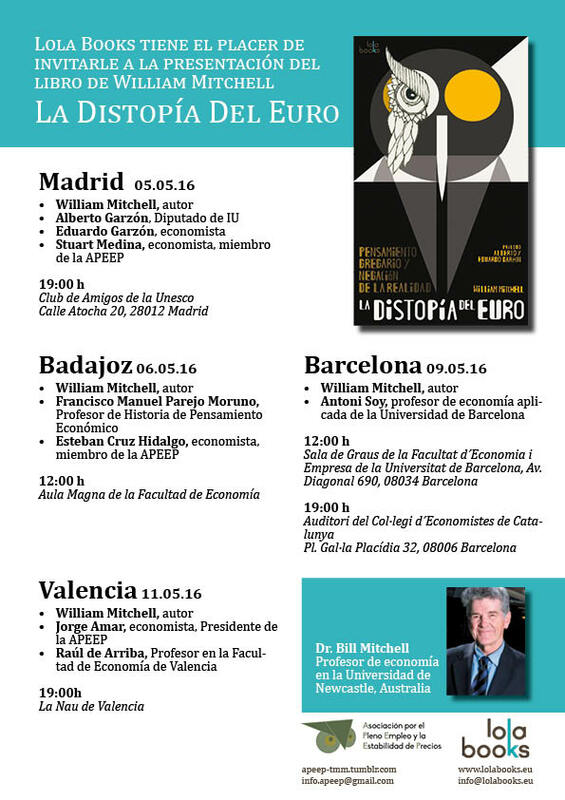 I am travelling to Europe next week – see below – and I have a very heavy schedule of commitments to honour. The blog may be quite unreliable in that time and at times non-existent. The commitments below begin next Thursday, May 5, 2016, but I have other (non-public) commitments in Europe from Monday, May 5, 2016 which will also take up time and keep me away from my desk. We will see. I will try to report on the daily activities in Spain though. 1. I have just yesterday received my textbook and scanning page 138 the equation appears corrected as you have written above except that it is equation 7.15b, not 7.16. (equations 7.16 are the expenditure multiplier). 2. Wouldn’t it be possible for Mr Morrison to reduce the budget deficit *and* increase inflation (thereby saving us from this deflation – which no doubt was Labor’s fault) simply by upping the GST? “Wouldn’t it be possible for Mr Morrison to reduce the budget deficit *and* increase inflation (thereby saving us from this deflation – which no doubt was Labor’s fault) simply by upping the GST? You should try some of Bill’s weekend quizzes. You’d then start to understand that the government’s deficit cannot be reduced simply by increasing taxes and reducing spending. If the government really wanted to reduce its deficit it would have to discourage everyone else saving. That would include our overseas trading partners who sell to Australia more than they buy from Australia and save the difference. The way to do that would be to keep interest rates low and engineer some inflation into the system – by increasing government spending and reducing taxation. So, perhaps counter intuitively, the way to reduce the government’s deficit in the longer term is for it to spend more and tax less in the shorter term. petermartin2001. How right you are, and question 1 on today’s (Firday’s) quiz deals with this very matter. Bill, I agree that with inflation low or negative and unemployment high we need much more stimulus. What bothers me however is the discordant feature of inflated house prices and inflated rents. How can we stimulate overall aggregate demand and take pressure out of real estate at the same time? This bothers me as a practical question. Clearly, we are in this odd position of low overall CPI with an over-valued housing market due to much bad policy in the past. But how do we progressively correct it now? What are the real, practical policies which would achieve this? Is it supposed to be confusing to the lay person about whether we’re in deflation or inflation? If the CPI has been altered in the last 35 years to not accurately represent the economy, are prices rising to back up the CPI or why are prices rising? Bills and the cost of living has risen dramatically, the price of a Big Mac has increased from $5.50 in February to $7.40 in June 2016. Yet there’s now an oversupply of housing, stagnant wages and companies and government cut costs by closing stores and laying off workers. Especially in hindsight people would be able to see the true economic situation as well as what was recorded. The Liberal party sell their policies by telling people they will solve the very scary fiscal deficit but they don’t. I can’t believe they won the last election.